Rare vintage Satyajit Ray movie poster of one of the finest films ever made in Bengali cinema, Hirak Rajar Deshe (1980) for sale. 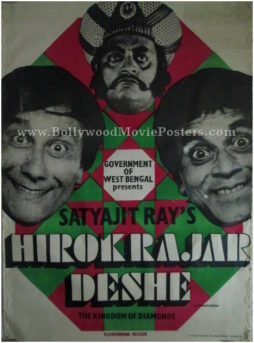 Written and directed by master filmmaker Satyajit Ray, Hirak Rajar Deshe is a sequel to his 1969 film Goopy Gyne Bagha Byne. The film was followed by the third film of the series directed by Satyajit Ray’s son, Sandip Ray. The soundtrack of Hirak Rajar Deshe won three National Film Awards in three categories. Satyajit Ray won two awards, one for Best Music Direction and other for Best Lyrics, making this rare Satyajit Ray movie poster highly collectible! Printed and circulated during the first release run of the film (somewhere in the early 1980s), this is one of the rarest Satyajit Ray film posters for sale that one can buy.